Postproduction care and handling of spring crops presents a challenge for retail garden centers and roadside stands. Plants must survive retail display conditions and also continue to grow and flower in the landscape. This fact sheet will focus on caring for plants in the retail setting, but postproduction care does not begin here. It involves the combined efforts of breeders, propagators, growers, shippers, retailers and consumers to provide the best environment for the plants. If any one of these links misses the mark, the result will be poor quality plants, unhappy customers and fewer repeat sales in the end. Even the best retail area will not improve plants that exhibit poor growth habit or disease susceptibility, or have large, overgrown lush growth, or are bruised, broken, insect infested, yellowed or dried up. The retailer's responsibility begins by purchasing and/or growing high quality plants to sell. Higher quality material sells more rapidly. This accelerates turnover and reduces shelf life problems. Also, quality plants are better able to cope with greater stress on the retail shelf. Once plants are in a retail display, there are several conditions that can be manipulated to provide the best possible environment for spring crops. They are temperature, light, air circulation, water, sanitation and fertilizer. High temperature is one of the most important factors to control in the retail area. Avoid displaying plants on asphalt or cement parking lots in full sun. The heat radiating from the surface will cause root and leaf temperatures to reach hazardous levels, water loss will increase, and the growing medium will dry out quickly. Plants will decline and ethylene levels will increase. The result will be chlorotic, poor quality plants. Most experiments with bedding plants show that cool temperatures are the most important environmental factor in increasing shelf life. Cool temperatures slow plant metabolism and reduce respiration and plants are less sensitive to ethylene. Shading and air movement are ways to help keep temperatures cooler for plants in the retail setting. Regardless of the species, bedding plants displayed at garden centers should be shaded from the sun if temperatures are expected to be 68 F or higher. A shaded retail area prevents plants from reaching high temperatures and provides a comfortable shopping environment. The use of a material that shades about 50% of the midday sunlight will reduce light to appropriate levels. This is particularly important in the late spring as light intensity and temperature increases. While shading is important, too much shade can cause plants to become tall and leggy also reducing the quality. For example, this can occur if plants are provided with shade, then displayed on tiers of shelves, or if hanging baskets are too densely spaced above plants. Good air movement is also essential in the retail area to prevent pollution (i.e., ethylene) and high temperatures. Air movement naturally dilutes buildup of pollutants and it also lowers the temperature. Using overhead fans in the retail area can provide necessary air movement. Ethylene is a plant hormone and growth regulator that is active at very low concentrations. In the production phase ethylene can be used as a tool to control plant growth, but in the postproduction phase ethylene can be devastating to plants. Symptoms of ethylene damage include premature loss of foliage and flowers or premature flower death. Flower petals become translucent, some plants develop of adventitious stem roots (e.g., tomato), and petioles may twist or show epinasty. Sources of ethylene include: Exhaust from cars, trucks and non-electric forklifts; pollutants such as cigarette smoke; plants and flowers that are under stress; fungi such as botrytis and some bacteria; incomplete combustion and/or poorly ventilated heaters located in tight greenhouses; and fruits and vegetables. Generally reproductive tissue produce more ethylene than vegetative parts. Highly sensitive - Geranium, Impatiens, Salvia, Snapdragon. To limit ethylene damage in the garden center or roadside stand, keep areas clean where plants are being stored and displayed since spent foliage and flowers produce ethylene. Maintain cool temperatures as mentioned earlier. The higher the temperature, the less ethylene it takes to induce plant disorders. Avoid storing fruits and vegetables in the same area where ethylene-sensitive species are being held. Apples in particular produce large amounts of ethylene. Display plants in a well ventilated area and if a heated greenhouse is being used, be sure the heaters are working properly. Little can be done about automobile traffic except to display less susceptible species, nearer the road and place those more susceptible as far away as possible. Building a display area that provides good ventilation will help to reduce the ethylene problem and reduce temperature, especially when combined with shading. In a busy spring there are seldom enough knowledgeable salespeople present. Nothing turns customers away faster than poor-looking plants and a messy area. It is important to provide some training to temporary helpers. At the very least, they should know that plants should not be watered without water breakers. Knocking over plants by using a hard spray of water results in ethylene production and reduces shelf life. Also, careless overhead watering can easily damage plants and leave them wet and uncomfortable to handle for customers. Bedding plants on display will require regular, gentle watering to maintain high quality. Watering must be completed well before dark, so plants will dry off quickly, preventing foliar diseases. Hanging baskets can become a hazard if not properly located in a retail setting. 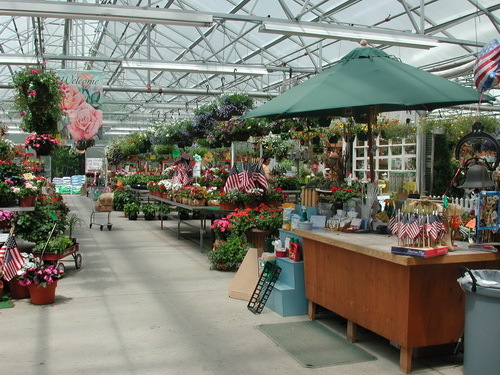 Place hanging baskets in areas beside the aisles, not over aisles where water and fertilizer will drip onto customers and create dangerous situations. Hand watering and drip irrigation remains the most common method of irrigation in retail displays, although some retailers are successfully using subirrigation systems. If plants are to be watered by hand, be sure to furnish sufficient time and personnel to water thoroughly and regularly. Anything less, and plant quality will decline rapidly. Keep plants and surrounding areas clean. There must be enough people, even during the busiest times, to clean up. Removing dead and injured plants and spent flowers is essential at least twice a day during the busy season. Not only do people get turned off when plants look bad, but high ethylene concentrations can be produced. A skilled employee isn't necessary for these jobs, but a competent one is. Employees might carry pruning shears and wear work aprons with large pockets where they can keep dead flowers and debris from plants in the sales area until they can find a waste can. Bedding plants that are purchased quickly will not require fertilizer in the retail setting. These bedding plants will be planted out in the garden where they will be fertilized and have room to grow. Plants in hanging baskets and planters will stay in those containers throughout the summer and will need fertilizer while in the retail sales yard. Frequent watering with plain water and rainfall can cause much of the fertilizer to be leached out and plants often exhibit deficiency symptoms such as yellow or reddish foliage. The plants will quickly decline in quality once the customer takes the basket home. Options for fertilizing include the use of water soluble fertilizers or topdressing with a controlled-release fertilizer according to directions (If it was not applied prior to shipping). Retailers should communicate with their wholesale growers to make sure controlled-release fertilizer has not already been applied prior to shipping before fertilizing plants. Before fertilizing, check hanging baskets and mixed planters for the presence of controlled release fertilizer (CRF) prills and whether they are still releasing fertilizer. Squeeze a few to see if the prills are depleted. If you find mostly empty prills, or if prills were washed out, another application of CRF may be needed. A good practice for mixed planters and hanging baskets is to topdress with controlled-release fertilizer according to the label when the plants are sold. The consumer can quickly ruin months of effort growing high quality plants with inexperience or neglect. Care and handling information is an essential part of the customer's success with their spring plants. Provide detailed tags and display waterproof posters containing planting and care information to help your customers be successful with their plants. This perhaps, is even more important with flowering hanging baskets and planters than for any other floriculture crop because of the amount of care required to maintain them through the summer. Purchasing and growing high quality plants to sell, and manipulating temperature, light, air circulation, water, cleanliness and fertility in your garden center or roadside stand will ensure that your customers have the greatest chance for success with their spring plants. As a result your customers will provide you with repeat sales. Argo, W.R. and J.A. Biernbaum. 1994. In Tips on Growing and Marketing Hanging Baskets. Ohio Florist Association. Columbus, Ohio. deOliveira, S.F, Fisher P., Huang J.,Mello S. 2016. Strategies to Provide Fertilizer for Both Production and Consumer Phases of Petunia. HortTechnology 26(2):164-175. Nell, T.A. 1994. Postproduction. In Tips on Growing Bedding Plants. 3rd ed. H.K.Tayama, T.J. Roll, and M.L. Gaston, eds. Ohio Florist Association. Columbus, Ohio. Tips on Growing Bedding Plants. 1987. The Ohio State University. Wolnick, D.J. 1985. Retail sales area layout and display. In Bedding Plants III, J.W. Mastalerz and E.J. Holcomb, eds. Pennsylvania Flower Growers.